This material was first presented on 06/09/12 to ensure timely dissemination of scholarly and technical work in accordance with IEEE Publication Services and Products Board Operations Manual, Section 8.1.10, Electronic Information Dissemination. Copyright and all rights therein are retained by the author and by IEEE as indicated below. All persons copying this information are expected to adhere to the terms and constraints invoked by this copyright. This work may not be reposted without the explicit permission of the copyright holders. Abstract: Nuclear fission energy is as inexhaustible as those energies usually termed "renewable", such as hydro, wind, solar, and biomass. But, unlike the sum of these energies, nuclear fission energy has sufficient capacity to replace fossil fuels as they become scarce. Replacement of the current thermal variety of nuclear fission reactors with nuclear fission fast reactors, which are 100 times more fuel efficient, can dramatically extend nuclear fuel reserves. The contribution of uranium price to the cost of electricity generated by fast reactors, even if its price were the same as that of gold at US$14,000/kg, would be US$0.003/kWh of electricity generated. At that price, economically viable uranium reserves would be, for all practical purposes, inexhaustible. Uranium could power the world as far into the future as we are today from the dawn of civilization—more than 10,000 years ago. Fast reactors have distinct advantages in siting of plants, product transport and management of waste. In 1983, Bernard L. Cohen [Cohen, 1983] showed quantitatively that uranium as nuclear fission fuel is, for all practical purposes, inexhaustible, given the use of fuel efficient breeder reactors. This idea had also been suggested earlier by others [Lewis, 1968]. The aim of this paper is to support this claim and show that technology is close at hand to take full advantage of this endless resource. When energy sources such as hydro, wind, solar, biomass and geothermal are termed “renewable”, what is really meant is that they are inexhaustible. If, for all practical purposes, nuclear fission fuel is inexhaustible, then it too is one of the “renewables”. Moreover, nuclear fission has much greater capacity to provide energy than all of the other "renewable" energies put together. The paper in Track 1 of this conference, “A Strategy for Adequate Future World Energy Supply and Carbon Emission Control” [Lightfoot, 2006], makes the case that nuclear fission is the only source of energy large enough to replace fossil fuels on the scale required that is available now. Currently, primary energy supplied by nuclear fission is about 29 EJ/yr (EJ = 1 exajoule = 1018 joules = 0.95 quads) and is growing slowly at about 0.3 EJ/yr [Schneider, 2005]. However, as fossil fuels become scarce the use of nuclear fission energy will have to grow considerably faster than the current rate if it is to replace even the 2005 fossil fuel consumption of 388 EJ. The uncertainty of long term fossil fuel supply is a good reason to proceed expeditiously with development and commissioning of nuclear fast reactors. We must be ready with a source of fuel that is large enough to displace fossil fuels because they comprise 85% of the world’s fuel supply and are directly related to people’s well-being [Hoffert, 1997]. Replacing the current thermal reactors which use about 0.7% of the uranium fuel with fast breeder reactors that consume virtually all of the uranium will assure long term energy supply, much-reduced waste management problems and better proliferation resistance [Wade, 2000]. Fossil fuels burn in air to provide heat that is used to generate electricity, and to provide energy for transportation and for residential, industrial and commercial applications. Burning fossil fuels generates carbon dioxide and pollutants of various kinds. Nuclear fission provides heat for all of these applications, but without emissions of carbon dioxide, sulfur, mercury, nitrogen oxides, etc. 2.0 How much nuclear fuel does the world need? Table 1 is an analysis of supplying all of the world’s primary energy at the estimated 2005 consumption rate [IEO, 2003] with nuclear power. The purpose is to try to make a rational guess as to how much energy the world might use in the future if fossil fuels were replaced entirely by nuclear fission energy. Electricity generation accounts for 37% of global primary energy consumption, and all of that 37% could be supplied by nuclear fission. Renewable energies meet 8-9% of current world primary energy demand and account for about 20% of electricity generation. However, those sources have well defined growth limits and their contribution will become a smaller percentage of world primary energy demand as the demand grows. For purposes of this analysis, renewable energies are assumed to make no contribution to electricity generation. 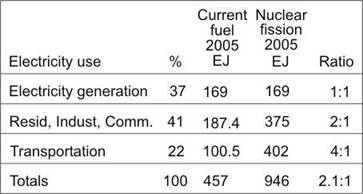 Primary energy for electricity generation in 2005 was 169 EJ and would be the same if it were all from fission. Residential, industrial and commercial uses account for about 41% of the world’s primary energy demand and all of it can be provided by nuclear generated electricity except the part used in industrial for raw materials, such as petrochemical feedstock, coke and graphite manufacture, etc. Residential, industrial and commercial are expected to consume 187.4 EJ of primary energy as fossil fuels in 2005. They would consume 375 EJ of nuclear fission energy delivered as electricity based on the reasonable assumption that generating electricity and using it for heat is about one-half as efficient as burning fossil fuels directly on site, hence the ratio of 2:1. Transportation consumes about 22% of the world’s primary energy [IEA, 2005] and 95% is supplied by oil [IELS, 2005] simply because there are no alternatives available today on the scale required. For purposes of this analysis, it has been assumed that nuclear fission energy could be used to manufacture transportation fuel at an energy ratio of four units of fission energy to one unit of transportation fuel. hence the 4:1 ratio. At this point, we do not speculate on what the transportation fuel might be, except to say that railroads could be electrified and large ships can be nuclear powered. The sum of the nuclear fission replacement energy, taking into account inefficiencies introduced by conversion processes, comes to 946 EJ to displace the 457 EJ of total world energy consumption in 2005, of which 388 EJ, or 85%, is fossil fuels. Global energy consumption is growing such that the IPCC “Business as usual” scenario IS92a suggests it could reach about 1,453 EJ/yr in 2100 [Hoffert, 1998], or about four times the 1990 level of 350 EJ/yr. For purposes of this analysis, the not unreasonable assumption is made that world energy demand could reach about 2,500 EJ/yr in 2200, and then level off. This 2,500 EJ would be about five and a half times 2005 world energy demand, and is about what would be required to bring average energy consumption per person up to about the current level enjoyed by the average European. In Figure 1, Line 1 is the quantity of primary energy the world might use based on the current mix of energy sources. Line 1 starts at 421 EJ/yr in 2000 and passes through 1,453 EJ in 2100, based on IPCC “Business as Usual” scenario IS92a. It continues at the same slope and reaches 2,500 EJ/yr in 2200, where it levels off. 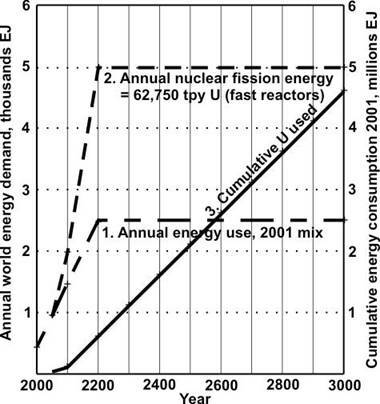 Line 2 starts at 940 EJ in 2050, at which point half of all energy is assumed to come from nuclear fission. At 2100, it is assumed that all of the world’s primary energy is from fission and Line 2 continues to 5,000 EJ in 2200 and then levels off. Line 3 is the cumulative consumption of uranium for the period 2000 to 3000 based on Line 2, and can be compared to the estimated quantities of energy available from uranium given in Table 2. A nuclear reactor converts the fissile components, such as 235U, of nuclear fuel into energy, and fertile components, such as 238U, into fissile components and then into energy. A fissile atom is one that is very likely to be fissioned (split) when a neutron is absorbed, thereby enabling a nuclear chain reaction. A fertile atom is one that can be converted to a fissile atom by absorbing one neutron. In the fission process, which is an exothermic reaction, about 0.09% of the total mass of a uranium atom is converted to energy. Most of this energy is manifested as increased temperature inside the reactor fuel. Liquid heat-transfer material is circulated through the reactor to control the temperature. It also extracts heat for useful purposes, such as to produce steam to drive a turbine connected to an electric generator. Fast neutrons produced in the fission reaction are “moderated” (slowed) when they bounce off light atoms such as hydrogen or carbon. A thermal reactor contains a large amount of such moderating material to slow down the fission neutrons. This takes advantage of the fact that the probability of a neutron being absorbed into another 235U nucleus is much higher at low neutron energy. As a result, the chain reaction can be sustained with a low concentration of fissile isotopes—the 0.71% of 235U in naturally occurring uranium will suffice if the other materials in the reactor do not capture too many neutrons and so prevent them from being absorbed into 235U nuclei to continue the chain. Some neutrons are absorbed in fertile nuclei during this process, thereby producing fissile nuclei. These newly created nuclei also contribute to sustaining the chain reaction. Also, some of the fertile nuclei are directly fissioned by fast neutrons. The main advantage of a thermal reactor is that, depending on its design and the choice of neutron moderator, it can use either natural uranium as mined, which is 0.71% 235U and 99.28% 238U, or uranium that is somewhat enriched with the fissile isotope 235U. Unfortunately, thermal reactors can use less than 1% of the uranium originally mined because of the decrease in the number of fissile nuclei as the chain reaction proceeds, and the consequential need to replenish these fissile nuclei by extracting them from fresh uranium ore.
A thermal reactor requires the mining of a large amount of uranium from which a relatively small amount of useful energy is extracted. Many materials produced in fission are radioactive but decay to extremely low levels in a few hundred years. However, some of the heavy elements produced by neutron capture remain radioactive for thousands of years after being discharged from the reactor. These are the bothersome elements that are responsible for the prolonged controversy over the licensing of the Yucca Mountain repository. Fast reactors get their name from the fact that the neutrons released in the fission reaction are not slowed down as in a thermal reactor. Fast reactors contain a minimum of moderating material. Under these conditions, fission neutrons are absorbed at quite high energy to sustain the chain reaction. A fast reactor can be configured to produce either more or fewer fissile atoms than it uses to sustain the chain reaction. In other words, it can be a net producer or a net consumer of plutonium. Because of its ability to produce more fuel than it uses, fast reactors are often called “fast breeder reactors”. In Europe fast reactors are known as “liquid metal reactors” (LMR). A major advantage of this design stems from the fact that more neutrons are emitted during high-energy fission than during low-energy fission. These extra neutrons convert more of the fertile nuclei to fissile nuclei as the chain reaction proceeds. The result is that fast reactors can convert all of the fertile material to fissile plutonium if external reprocessing and fabrication facilities are provided to remove the true waste and recycle the remainder. Eventually a fast reactor can split almost all fertile and fissile nuclei to yield more than 100 times the energy from the original mined uranium than do thermal reactors. Another important advantage follows from this total destruction of heavy atoms. A fast reactor produces much less long-lived radioactive waste than thermal reactors. Waste from fast reactors is almost free of harmful radioactive atoms less than 500 years after its discharge from the reactor [Stanford, 2001][Adamov, 2004]. The hundred-fold fuel efficiency advantage over thermal reactors brings a third benefit—a big one. It is obvious that a mineral deposit becomes an “ore” only when the valuable material can be recovered at an acceptable cost. If we increase uranium’s unit value to society by more than one hundred times, then the number of deposits that can be classified as economically recoverable is vastly increased [Meneley, 1995]. Herein lies the fundamental reason for building fast reactors—they are electricity producers in their own right, but they are also “fuel factories” that extend uranium resources well beyond our foreseeable horizon and into the millennia beyond. The production of 1 EJ of electricity requires 120,000,000 tonnes of coal or 5,000 tonnes of uranium in a thermal reactor. A fast reactor requires only 50 tonnes for a mass ratio of 2,400,000 to one compared to coal. This illustrates the great advantage of nuclear energy in fuel and waste handling requirements, and another practical example of the advantages of fast reactors. The first-ever electricity produced by nuclear fission came from the EBR-I fast reactor in the U.S. in 1951. However, today the vast majority of nuclear power is produced by thermal reactors. Several countries (U.S., Britain, France, Russia, Japan) have built and operated fast reactors of early design. Only two fast reactors are generating power today—Russia’s BN-600, which has been producing electricity since 1981 [Adamov, 2004], and France’s Phenix started in 1974. Safety features in design and operation of fast reactors are mostly similar to those of thermal reactors. Differences are relatively small, tend to favor fast reactors and the engineering solutions are in hand. Waste management is much easier with fast reactors because almost all of the long-lived nuclear waste products associated with thermal reactors are split by the fast neutrons. The radioactive materials remaining are of concern for less than 500 years. In fission reactors using uranium, the process of “burning” nuclear fuel involves production and consumption of plutonium. In a thermal reactor, perhaps 30% of the useful energy comes from fissioning of plutonium. A fast reactor, on the other hand, derives almost all of its energy from plutonium. Current procedures for security and safe handling of the many varieties of radioactive materials are equally applicable to fast reactors. In addition to the atomic energy regulators of many countries, a section of the United Nations is dedicated to coordinating these procedures and ensuring they are followed world-wide. It has been suggested that the threat of proliferation can be further reduced by means of a “hub-spoke” arrangement. Under one variant, there would be secure energy parks where fast breeders or a fusion/fission hybrid would use uranium or thorium to generate fuel for small, plug-and-play “battery” reactors, 10 MWe and up, whose cores would be rented as sealed units to countries needing electric generators. After a lifetime of 15−30 years the core would be traded to the energy center for another. The reactors could be multipurpose—for process heat and desalination, as well as generating electricity [Manheimer, 1999] [Wade, 2000] [Feiveson, 2001]. If fast reactors have such a large fuel economy advantage over thermal reactors, why are there not more fast reactors in use today? The answer has three parts. First, uranium is so inexpensive today that there is little incentive to use it more fuel efficiently, and storage of the unused uranium and other nuclear waste is manageable in the short term. Second, thermal reactors were first to be introduced commercially and have been continually improved. And third, in the early 1990s energy supply was perceived to be secure and the Integrated Fast Reactor Program at Argonne National Laboratory in the U.S. was cancelled in 1994 [Till, 2005]. It was considered the most advanced fast reactor research program in the world at that time. Concern about secure energy supply is now generating renewed interest in developing modern, commercially available fast reactors. For example, in order to extend their nuclear energy resources, India [Rodriguez, 2000] and China recently declared that they will invest heavily in fast reactors, as will Japan. This section examines the amount of nuclear fuel available from all sources, and the effect of its price on availability. Line 2 of Table 2 shows the Intergovernmental Panel on Climate Change (IPCC) resources base of uranium as 7,700 EJ of energy available [Metz, 2001]. This estimate is based on a thermal energy equivalent of 500 TJ/tonne of uranium, which is the average rate at which current thermal reactors extract energy from uranium. Fast reactors can increase the thermal energy available to a theoretical maximum of 79,440 TJ/tonne, about 160 times that of a thermal reactor. For purposes of constructing Table 2, 160 times has been used. Therefore, the results in the fast reactor column of the table might be more or less optimistic depending on the specific fast reactor design. Early in the nuclear era, uranium was thought to be in short supply as a long term replacement for fossil fuels [Lewis, 1968] unless fast reactors were soon introduced to increase greatly the fuel efficiency. But that feeling of urgency waned when further exploration yielded large new uranium discoveries, uranium demand did not increase as expected and fossil fuels seemed limitless. Today, 7,700 EJ does not seem large anymore, and fossil fuel limits are becoming evident [Oi, (1), 1997]. In Table 2, Line 1, the estimate in 2002 by the United States Geological Survey (USGS) of reasonably assured uranium resources based on a cost category of less than US$80/kgU [USGS, 2002] is 3,192,500 tonnes. World uranium consumption of 64,000 tonnes/yr in 2001 for thermal reactors would consume these reserves in about 50 years. The Intergovernmental Panel on Climate Change (IPCC) estimate of 15,400,000 tonnes [Metz, 2001] of uranium reserves based on a cost category of less than US$130/kg, Line 2, would last for 240 years. Two factors work very much in favor of uranium being economically viable at much higher prices. The first is that energy content per unit of weight is very high. For example, 1 kg of uranium has as much potential energy as 2,300,000 liters of gasoline. The second is that the price of uranium when converted to other forms of energy, such as electricity, is a very small part of the retail price. For example, at a U3O8 (yellow cake) price of about US$70/kg [UC, Oct 2005] the raw material cost of the uranium to produce electricity in thermal reactors is about US$0.0015/kWh [Pendergast, 1990]. If the price of U3O8 were to increase 100 fold to US$7,000/kg, the price of electricity would increase by about US$0.15/kWh, which compares with the current retail price of electricity in North America being US$0.05 to US$0.15/kWh. Thus, if the current price increased even that dramatically, the price of electricity would increase to US$0.20 to US$0.30/kWh, which would be manageable. However, with fast reactors that “burn” virtually all of the uranium, even if U3O8 increased in price about 200 times from US$70/kg to the current price of gold at US$14,000/kg, the fuel cost for electricity generated by nuclear fission breeder reactors would be less than US$0.003/kWh. At US$14,000/kg, immense quantities of uranium in crustal deposits would become economically viable. For example, one tonne of current low grade ore [WNA, 2004] at 1,000 parts per million (ppm) of uranium would contain 1 kg of uranium with a selling price of US$14,000. It is likely that enough uranium would be available to power the world for as far into the future as today is from the day more than 10,000 years ago when civilization dawned. This would require about 40-50 times more uranium than the IPCC estimate in Line 2 of Table 2. It is estimated that 20,000,000 tonnes of uranium are distributed in phosphate deposits at concentrations of 3 to 400 ppm [Anwar, 1992], and would likely be economically recoverable for fueling fast reactors if the need arose. 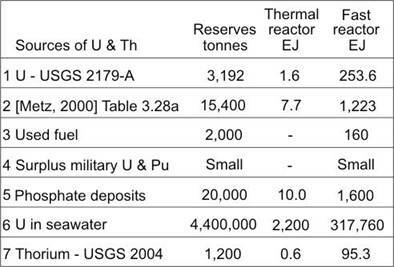 This source would provide about 1,000,000 EJ of energy from fast reactors, or close to the same as the 1,223,000 EJ from the IPCC uranium reserves estimate in Table 2, Line 2. The estimated 4.4 billion tonnes of uranium in the oceans of the world at a concentration of 3.3 parts per billion is often considered as an inexhaustible uranium mine by itself. However, extraction of uranium from seawater at such a low concentration is not easy. The ion exchange resin must be exposed to enormous quantities of seawater [Hoffert, 2002]. The resin is not specific to uranium and picks up other metals at the same time. Development of ion exchange resins, which began more than twenty years ago, is at the stage where 350 kg of resin as non-woven fabric can recover >1 kg of uranium (expressed as U3O8) after 240 days of submersion [Seko, 2003] in a suitable natural ocean current. Although this is an interesting experiment, the need for large scale extraction from seawater is very far in the future. Nevertheless, a cost effective way to access that uranium would be beneficial because probably many more countries have access to the ocean than to land based uranium reserves. The uranium already on hand constitutes a very large energy resource, since probably less than one percent of its energy, overall, has been extracted. Approximately 2 million tonnes of uranium have been mined so far [WEC, 2001]— equivalent to almost two-thirds of the current uranium reserves reported by the USGS, based on US$80/kg, Line 1, Table 2. Since much of its fissile isotope 235U has been consumed in reactors, the vast bulk of the energy in the uranium already on hand is unavailable to thermal reactors. However, fast reactors can extract essentially all of that energy. In principle, this uranium could meet the world’s energy needs for the next 150-200 years. Thorium can serve as a reactor fuel, and constitutes another energy resource that could be tapped if there were a reason to do so. The thorium route is interesting enough that it is being investigated by Japan, Russia, the U.K. and the U.S. [UIC, 2004]—and India with limited indigenous uranium. A Canadian study of an accelerator breeder reactor concept was reported in 1980 [Fraser, 1981]. The proposed system works by accelerating and impacting protons into uranium-plutonium or thorium-uranium fuel assemblies to produce fissile material. Energy can be also be released by nuclear fusion (combining of atomic nuclei). In the case of “d-t fusion”, a deuterium (d) nucleus and a tritium (t) nucleus fuse to create a helium nucleus (alpha particle) and a neutron. While deuterium is readily extracted from water, tritium is not naturally present on earth but can be manufactured from lithium (6Li) using neutrons from the fusion process. Nuclear fusion to provide heat is extremely difficult to achieve. Research has been supported for over 50 years, and even optimistic proponents do not see any possibility of a commercial fusion reactor delivering heat for the production of electricity in less than 35-40 years. It turns out that using the neutrons of the fusion process to generate fissile fuel for fission reactors, rather than extracting heat directly, increases the total energy output of a fusion reactor by a factor of ten. This happens because splitting one uranium nucleus releases ten times more energy than combining two hydrogen nuclei. Moreover, it appears that manufacturing fission fuel with the fusion process is significantly less challenging technologically than extracting heat. There have also been suggestions that neutrons from the fusion process might be used to transmute radioactive waste into benign materials [Manheimer, 1999]. The contribution of the price of uranium (yellow cake, U3O8) at US$70/kg to the cost of electricity from thermal reactors is US$0.0015/kWh. Fast reactors use virtually all of the nuclear fuel, and are more than 100 times as fuel efficient as thermal reactors. Therefore, with fast reactors, the price of uranium can increase by about 200 times, to the current price of gold at US$14,000/kg, and yet contribute less than US$0.003/kWh to the price of electricity. Insensitivity to the cost of fuel allows very high prices for mined uranium. For all practical purposes, very low grade ores become economically viable and the supply of uranium then becomes inexhaustible. It is likely there is enough uranium available to power the world for as far into the future as today is from the dawn of civilization more than 10,000 years ago. This would require 40-50 times more uranium than the IPCC world supply estimate of 15,400,000 tonnes at US$130/kg. Thus, nuclear fission energy is inexhaustible like solar, wind, hydro and biomass, but has the capacity to replace fossil fuels on the scale required, thereby providing energy for many millennia and sharply reducing carbon emissions to the atmosphere. The ability of a fast reactor to use virtually all of the nuclear fuel hugely simplifies the waste management task. For example, some components of the used fuel from thermal reactors remain appreciably radioactive for thousands of years, but waste from fast reactors is of concern for less than 500 years. Many of the most serious problems facing human society have an important energy component. We do not know when peak production for fossil fuels will come, but we know that it will eventually arrive. Considering the importance of energy to humanity, it would be prudent to have a substantial program for the development and commissioning of fast nuclear fission reactors under way now in order to be adequately prepared. Canada could replace all fossil fuel fired generating stations with fission powered ones as a reasonable start towards meeting its Kyoto commitment. This would reduce carbon emissions for the category “Public Electricity and Heat Production” for 2000 by 128 million tonnes CO2 equivalent [EC, 2002], and would be a relatively large step towards meeting the numerical part of Canada’s Kyoto commitment, but not in time for five year 2008-2012 compliance period. Fraser, J. S., et al, A Review of Prospects for an Accelerator Breeder, 40 pp., AECL-7260, Atomic Energy of Canada Limited, December 1981. Hoffert M.I., Potter S.D., et al., Chapter 4 of Engineering Response to Climate Change, Planning a Research and Development Agenda, Figure 4.1, page 214 of: Watts R, edited by, National Institute for Global Environmental Change, Tulane University, New Orleans, LA, Lewis Publishers, 1997. Hoffert, M.I., et al., Energy Implications of future stabilization of atmospheric CO2 content, Nature, Vol. 395, 29 October 1998, pp 881-884. Hoffert, M.I., Advanced Technology Paths to Global Climate Stability: Energy for a Greenhouse Planet, Science 298: 981-987, 2002. Lewis, W. B., The intense neutron generator and future factory type ion accelerators, Atomic Energy of Canada Limited, Chalk River Nuclear Laboratories, Report AECL‑3190. Presented to IEEE-GNS 15th Annual Meeting, Montreal, 23 October 1968. Manheimer. W., Back to the future: the historical, scientific, naval and environmental case for fission fusion, Fusion Technology, Vol. 36, July 1999. Manheimer. W., The fusion hybrid as a key to sustainable development, Journal of Fusion Energy, Vol. 23, Dec 2004 (published 2005), p 223. Sakharov, A., Memoirs, Vintage Books, New York, 1990, p. 142. Schneider, M., Froggatt, A., On the Way Out, Nuclear Engineering International, June 2005. Uranium Information Center (UIC), Thorium: UIC Nuclear Issues Briefing Paper # 67, November 2004. Available at: http://www.uic.com.au/nip67.htm as of 05/11/07. Experience: Standard Chemical Ltd—chlor/alkali electrochemical plant project engineering,12 years; Dupont of Canada—designing, building, starting up chemical plants, 5 years; Domtar Research—research and economic analyses for pulp and paper, chemicals and construction materials, 18 years. Retired member: Order of Engineers of Quebec, Professional Engineers of Ontario. Life Member: American Society of Mechanical Engineers. Member: Global Environmental and Climate Change Centre (GEC3), McGill University. Ph.D. (MIT). Retired from the Naval Research Laboratory, 33 years, Senior Scientist for Fundamental Plasma Processes involved in plasma processing, inertial fusion, microwave tube development, radar systems, and magnetic fusion. Now, part time consultant to NRL on plasma science. Discouraged by the constantly receding dates for implementation of magnetic fusion, Dr. Manheimer, in the last decade has been advocating that implementation of the fusion project be accelerated by switching from pure fusion to the fusion hybrid. Experience: Argonne Lab., Fast reactor physics research and design, 9 years. Ontario Hydro, CANDU power plant design, analysis, safety, & waste management, 12 years. UNB Professor of Nuclear Engineering, 7 years. AECL CANDU design management, 10 years. Emeritus Chief Engineer, AECL. Member Professional Engineers of Ontario. Fellow, American Nuclear Society and Canadian Nuclear Society. Member International Safety Advisory Group, IAEA, ’85-’88. Chair, Defence Science Advisory Board, ’97-’03. Experience: Industry – manufacturing and design engineer pressure vessels and transportation, 3 years. Education—university engineering subjects, 4 years. AECL—CANDU power plant safety analysis, design and environmental assessment, 26 years. Computare, Principal Scientist, consulting and website (www.computare.org) on energy and greenhouse gas management, 5 years. Retired member of Professional Engineers of Ontario. Life member of The Association of Professional Engineers, Geologists and Geophysicists of Alberta. Member of the Canadian Nuclear Society. Physicist, retired from Argonne National Laboratory. Past member, National Council, Federation of American Scientists. Co-author: Born Secret: The H=Bomb, the Progressive Case, and National Security [Pergamon, 1981], and Nuclear Shadowboxing: Contemporary Threats from Cold-War Weaponry [Fidlar Doubleday, 2004]. B.Sc. with Honours, Acadia University; M.A., Wesleyan University; Ph.D. in experimental nuclear physics, Yale University. Technical publications pertaining mainly to experiments in nuclear physics, reactor physics, and fast-reactor safety. Member, American Nuclear Society. Past member, American Physical Society.